Are you a Bride or Groom-to-be planning your dream wedding day? Are you worried you might have missed something important on your to-do list? We get it. Planning an event this huge is something most people do only once and it can be overwhelming. When planning for your big day, the dress, the venue, the flowers, and the food are in the spotlight while seemingly unimportant items on your to-do list, like transportation, get left to the last minute. We’ve been in the wedding business for YEARS so let us be the first to tell you, transportation can make or break your big day! 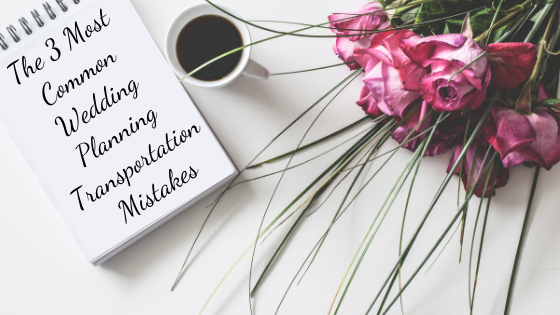 These are all easy to avoid so we’ve identified 3 of the most common wedding planning transportation mistakes so that your special day is flawless! The most common things couples tackle first when planning a wedding are the guest list, venue, food, ceremony, cocktail hour, reception, and THE dress. Couples get so caught up with these “spotlight tasks” that they either treat transportation as something pretty minor on their to-do list or, they forget about it entirely, until it’s too late. How are you getting your guests from one point to another? Who or how many are riding in the vehicles and what is the itinerary? Who is leaving earlier vs. who is in it for the long haul? Will you really be needing fleets of limousines or will a few SUV’s do the trick? All these questions will help you determine what kind of wedding transportation packages to avail or if you need a more customized option to fit your needs. If you choose not to prioritize your transportation needs early on, it is very unlikely that you’ve considered how these needs should fit the timeline and budget. We know, your head is spinning and full of details! We suggest arranging your wedding transportation at least four to six months before the big day. Also, if your wedding falls anywhere in between April and June book even earlier as these months are prom, graduation and festival season here in New Orleans and we may have less availability for our luxury vehicles during that time. Sidenote: Regarding your budget, take a look at the different Wedding Transportation Packages we offer. Consider the specific cost per hour, price in relation to mileage and other extra charges you may incur on the total distance covered. We can always discuss this over the phone – give us a call any time! If you have successfully arranged your transportation needs while considering the timeline and budget, it’s time to check and double-check the details. With so many responsibilities on your list it’s easy to miss a minor detail that could potentially ruin your perfect day. Providing us with details like the address, any special instructions for the venue, directions or alternate routes you’d like to use are always welcome and appreciated. Check in with guests who may wish to leave the celebration earlier so you can plan accordingly and offer other alternatives without hurting your wallet. These details may seem inconsequential but it’s always good to review so we can make sure everything goes smoothly. There is no such thing as overplanning your wedding. Trust us, in our years of experience we’ve encountered couples who have learned these lessons the hard way. By avoiding these 3 mistakes, you can save yourself from wasting your time, money, and A LOT OF STRESS. At Royal Coach Limousines, we believe in providing quality service to couples who dream of nothing but perfection during their wedding day. To avoid these wedding transportation mistakes, you may consult us by contacting us or calling us at (985) 282-8177 to arrange the best package for your big day.